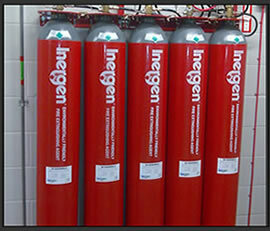 Inergen is a mixture of nitrogen, argon and carbon dioxide gases and has been specially developed to provide fire protection. Inergen extinguishes fire by reducing the oxygen level in a room to below 15%, the point at which most combustibles will no longer burn. Inergen has been medically evaluated and approved by leading authorities around the world. All of them have accepted Inergen as being safe for use in normally occupied areas. Excellent retention time within the room. Inergen is stored in gaseous form. It therefore does not produce fog when the gas is released into the room.